You know my old maxim “That we are paid to be civil & that to oblige if possible is a part of our peculiar duty” Well I act up to it rigidly enforcing it among the Division & Brigade Officers & I may say as regards the Regular Commt. they support me in it & work most manfully – in fact dearest it is no use disguising it, our duty is arduous & difficult in the extreme only hard work and determination has pulled us through both the C.G. & Adams Good men of Business are not au fait at the “Supply Branch” & run too much to detail and minute points of form but both have fortunately sense to see it won’t do at present & they do their best to pull on too. – Our poor fellows (Officers) knock up one after another – two are generally ill & recruiting strength to go to work again, none of the Regular Dept. give up if they can help it – Our Auxiliaries from Irish Constabulary are useless Storekeepers knock up daily, I have sent 4 away, 2 more go today & 1 is dead & 1 dying – this is since we came here – I myself keep in good health and in as good spirits as can be expected from one separated from all those who are dear to him but if success crowns the day I hope to have many a good tale to tell of [written across the page] our Campaigning in the Crimea. 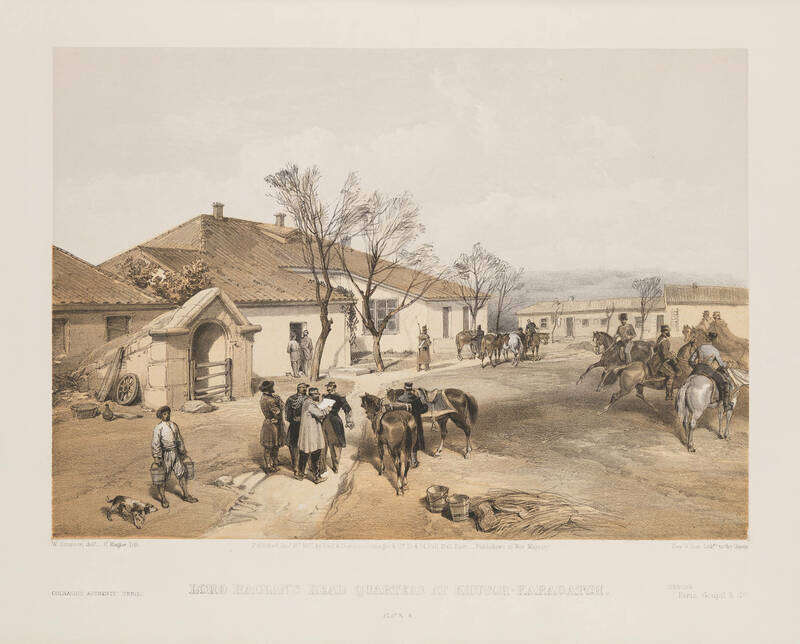 Lord Raglan’s Head Quarters at Khutor-Karagatch, by William Simpson. digitalcollections.smu.edu/cdm/ref/collection/eaa/id/1356, accessed 6 May 2015.